"A near-death experience teaches a man to accept his wife's practical realism"
Last year my wife saved my life. Literally, and repeatedly. First, emergency gastrointestinal surgery went wrong, and I ended up in septic shock--so near death, in fact, that the doctors asked her if I was "full code," meaning was she sure I wanted every measure taken to rescue me. "Yes. Of course. Do whatever you can," she answered. I had no documentation--no Living Will or Do Not Resuscitate order--but in our 20 years of marriage we had discussed this very eventuality before. This was no rinky-dink hospital. The original, botched surgery was done at the star-studded Cedars-Sinai Medical Center near Beverly Hills; the "full code" question--and subsequent three months in intensive care, with a grueling succession of multiple pneumonias, scattered blood clots and other complications--at the Ronald Reagan UCLA Medical Center, to where I was transferred by ambulance at 4 AM, when my incision started hemorrhaging, after Cedars had sent me home. After parking our two kids with her brother and then an overnight babysitter, my indefatigable wife kept bedside vigil. I couldn't speak because of a tracheostomy and was too weak to press the call button. She read my facial expressions and monitored my machines. Often, when their alarms sounded, she alerted the overworked nurses. That was life-saving gallantry No. 2. Then came six months' rehab at home. I was still tethered to a ventilator and feeding tube, with round-the-clock nursing care. Shockingly, however, the home health workers—not full-fledged RNs but less qualified CNAs and LPNs--proved almost without exception frighteningly incompetent. Medications were switched, supplied at the wrong times and in incorrect doses; my wife's eagle eye caught most errors before any real harm could be done. Injections were sprayed across my skin instead of into it--and when I, by then able to talk, politely pointed this out, the ill-equipped medic acted like I'd called her un-American. Dirty water was reused to wash me, despite my protests. And so on. My wife couldn't bear to watch and frequently stepped in. She became so good at, well, doing everything that these junior nurses began asking if she was a doctor! In time, we reduced their shifts to a bare minimum, which of course meant my exhausted wife took on more and more. My survival was in her hands once more. Now I am myself again, perhaps even better than before, and my wife is back to work at a neighborhood boutique. But even a year later, the repercussions remain with us. The shock, fear, and gratitude. Life is back to normal, but is it? Can it ever feel fully normal again? I told our story to a physician friend who practices in another state. I felt my wife and I had gone through something extraordinary. "It's not uncommon," he said to my surprise. "Family often has to be involved. The fact is, patients who are surrounded by family always get better care." "You mean patients need an advocate, someone looking out for you?" "No," he responded blithely. "Having loved ones around signals the staff that this person is important and deserves our special attention. It may sound terrible but it's true." I shuddered to think about those who are alone, or whose spouses can't take the time off work, as my wife did. How do they cope? Perhaps at this point I should disclose that my wife and I aren't exactly your typical couple. We're a mixed marriage, but not in the way you probably think. I was born with a severe neuromuscular condition called spinal muscular atrophy. I've never walked or stood; everybody was delighted when I lived to my third birthday. Today, at 47, I retain the musculature of a rag doll. Nevertheless, from my wheelchair I've graduated from Harvard, moved to the West Coast, become a freelance writer, married, and fathered two daughters. My wife is able-bodied--or at least as able-bodied as you might expect a midlife mother of two to be. So looking out for my well-being isn't exactly new to her. To be sure, my disability complicates our relationship. At times I rely on her too much for assistance with basic tasks. I maintain full-time hired help (attendants, not nurses) so we can pursue separate careers and enjoy a degree of autonomy from each other. She, in turn, has gotten in the habit of defining her life in terms of being needed--by me, our girls, her boss. It's a balancing act for both of us, but usually it goes quite smoothly. Until a snag arises. Hey, don't knock it till you've tried it! We like to think our interdependence gives us a tighter emotional bond than other couples. We have few secrets. And sometimes needing each other as we do keeps us from flying apart over minor disagreements. We're also allies against an often unfair world. Access barriers such as a flight of stairs can draw us nearer together, the unity of facing a common enemy. When other people treat me as an object of pity--appalling, really, in this day and age--it impacts her, too. She gets caught in the spatter of prejudice about me, an inadvertent victim. She's collateral damage. We keep a wedding portrait prominently displayed in our living room, like newlyweds, just to underscore the point that she married me aluminum casters and all. We are not noble, triumph-over-tragedy types. Don't take us for the late Mr. and Mrs. Christopher Reeve, thank you! Even so, some have been heard to mumble that I must be rich to have won her hand. When she was visibly pregnant with our second daughter, someone actually pulled her aside to whisper, "Is it really his?" You learn not to care what other people say or think. At least you try to. From my earliest memories I developed a guise of plucky good humor, peppered with barbed sarcasm. Yet I confess, there are times I want to shout "I am not my body; my body is nothing without me," echoing a character in a Tom Stoppard play (Eleanor from Rock 'n' Roll). The converse is also true--I'm nothing without my body. That is, my disability is part of me. I can't conceive of myself, or of life, without it. My wife is more practical-minded than philosophical, though she understands where I'm coming from. So I wasn't honestly all that stunned by her devotion during my illness. She's used to helping me, to taking care of what needs to be taken care of, and has always been incredible in a crisis. What I am having trouble with, however, is how long it seems to be taking her to bounce back. I've gained a keener sense of personal fragility than before, perhaps, but even a year later I'm like the island castaway returned to civilization. Everything is intense, brilliant and tasty. Look at the sky! Feel the air! She, on the other hand, is like one still lost at sea. Despite my doctors' reassurances about my health, she often still sleeps in clothes in case, she explains, of a middle-of-the-night dash to the emergency room. Worrying is not uncharacteristic for her, but this particular anxiety is clearly an emotional fallout from our ordeal. With my demands on her down to pre-hospital levels, and the adrenaline rush dwindled to a trickle, it's as if there's a vacuum in her life. She's searching for a sense of direction, struggling to regain her equilibrium. In fairness, my brush with the hereafter left her weary in a way I'm not. I mostly slept for eight months while she kept our home and me going. So why can't she sleep now? Outwardly all is fine, but at her weakest moments the inescapable shadows of vulnerability haunt her like post-traumatic ghosts. "You almost died," she reminds me when I bring this up. "It was very scary." She's right, of course. And perhaps I'm too quick to put a silver sheen on the inky cloud. That's not exactly an uncharacteristic coping strategy for me, either. "But it's all past," I insist, scrounging to heal her spirit as she helped mend my body. Perhaps that's it. The twin G's--guilt and gratitude. I want to repay her. Lately, it's occurred to me that it's not up to me to ease her pain. Time will provide an answer. It's up to me only to be patient. This is one of those things she must do for herself, no matter how long it takes. However much time it turns out to be must be accepted without resentment, like a spouse's hobby you can't relate to or share in. Not that I've stopped wondering how a marriage survives the kind of stress we underwent--the desperate, one-sided dependence over so many months. Recovery is not a light thing like an avocation. It's a rougher trial. Yet I'm beginning to see that getting through this will be like handling any other rough spot in a marriage. You go slow, with tolerance and humility. Ironically, it's only afterward, as the tensions and white-knuckle worries abate, that you begin to recognize what's revealed. For us, our disparate reactions--my delight in having a second chance at life, her once-burned-twice-shy caution--are symptoms of fundamentally different perspectives on the world. Simply put, it's a half-full-half-empty conundrum. The truth doubtless lies somewhere in between, but unless both viewpoints are brought into focus it's impossible to grasp it. I recall a discussion we had months before my surgery which had left me feeling confused, lost. I was reflecting on how fortunate I'd been. A good upbringing, good education--every advantage a person could ask for. "How can you say that?" my wife replied. "You were born with a severe disability, your parents divorced when you were nine, and your mom died when you were 18! Your life's been rough." I'd been thinking about how my parents had the intellectual, emotional and financial resources to take care of me when many other kids with disabilities were carted off to institutions...to insist on my being integrated in regular schools a decade before "mainstreaming" became law...to instill me with a sense of entitlement and rights, even when I had none legally. I'd been thinking about how I'd beaten the odds medically and in countiess other ways. Still, I could see her point. "Yes," I said. "But given all that, consider what I might have become, where I might have ended up." In retrospect, I probably should have added, "I was lucky enough to marry you, wasn't I?" Ben Mattlin is a writer and commentator in Los Angeles. 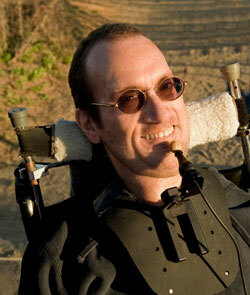 He is working on a memoir about growing up with a disability during the disability-rights movement.